ServiceNow provides service management for every department in your enterprise, including IT, human resources, facilities, field services, and more. 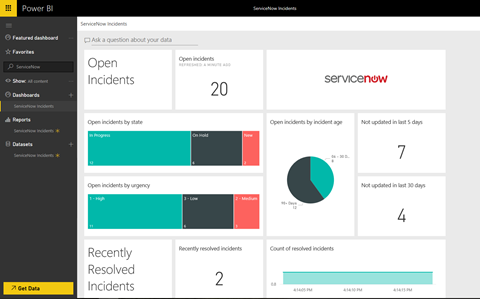 We are excited to announce the availability of a Power BI content pack for ServiceNow that's focused on incident management. The content pack gives you instant access to multiple reports and insights on your open, recently resolved, and recently closed incidents. 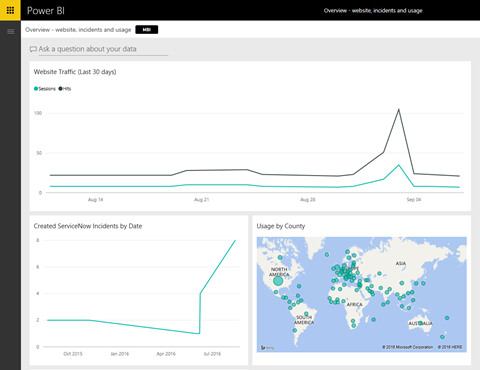 This post will explain how the Power BI content pack can help you analyze your ServiceNow incidents data. 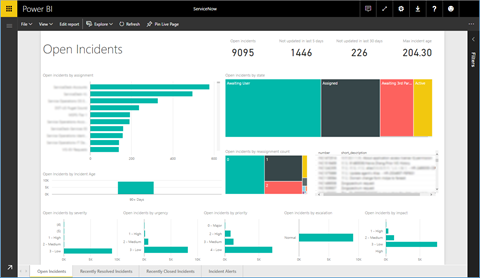 For additional details on how to get started, please see the Power BI help page. To connect to the content pack, simply provide the URL to your ServiceNow instance, and sign in with your username and password. Once the connection has been made, Power BI will automatically create a dashboard, report, and dataset with data from your ServiceNow account. The out-of-the-box dashboard offers an overview of insights included in the content pack, and you can select any of the tiles to drill down into the multiple pages of reports behind the dashboard. 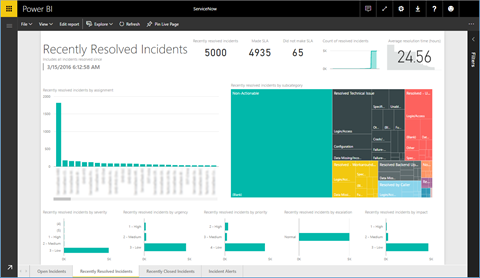 For example, selecting any of the tiles in the Open Incidents section will bring you to a report page dedicated to insights and metrics about your open incidents. You can hover over the visualizations to see additional details, and select a visual to cross filter the rest of the page. You can also switch to edit mode, where you can edit or add additional visuals to your reports. On the right, you’ll see a list of all the tables and fields you have access to in the content pack. In this case you have seven different tables from which you can pull information. From any of the reports, you can pin the visuals or tiles to the dashboard by hovering over them and selecting the pin icon. Pinning the visuals will prompt you to select a destination dashboard, allowing you to customize and combine data from multiple sources. For example, the dashboard below contains insights about website traffic, ServiceNow incidents, and product usage, all from different sources. After the initial import, the dashboard and the reports will continue to update daily, and you can control the refresh schedule on the dataset. 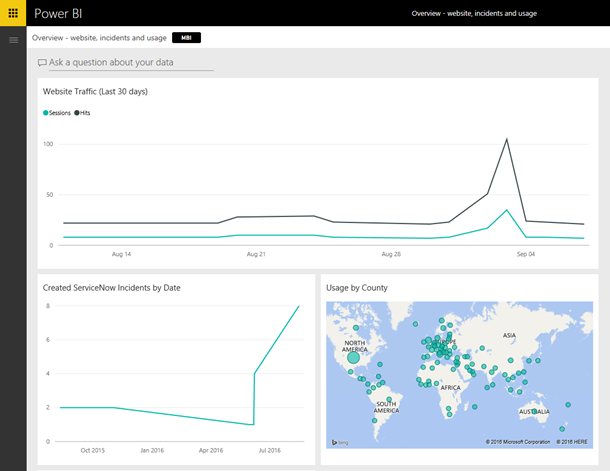 With the Power BI content pack for ServiceNow, you have an initial set of insights that you can use to explore your incidents data even further. We’re always interested in hearing your feedback! Contact us at http://support.powerbi.com to let the team know about your experience, and if there’s anything we can do better. Any suggestions, including other content packs for ServiceNow, are appreciated.